Day 5 | Колко е наемът? It looked like the winter had really set in now with the temperature hovering around -10 celcius and I had woken up this morning with a throat like sandpaper. I was snuffling and sniffing, I had a headache and was generally feeling sorry for myself. I skipped the library in the morning but dragged myself to lessons at 13:30. My Bulgarian teacher noticed I wasn't well and told me to go the doctor which again to my suprise turned out to be in one of the rooms in my accommodation block. I had previously discovered that there was a dentist in the same building as my accommodation block, and now I find out there is also a doctor. I suppose I found this quite suprising because the building looks quite spartan and there are no signs pointing the way to the dentist's or doctor's room, no posters or adverts, no information leaflets informing the students about the services that were available to them. They were just behind one of the seemingly hundreds of green doors like everything else was. If you knew the room number you could find them, but if you didn't you'd never know they were there. I find this a bit reflective of Bulgaria as a whole sometimes, it is as if a lot of things are hidden away and it can take a bit of time to discover them, but when you do you're pleasantly suprised. 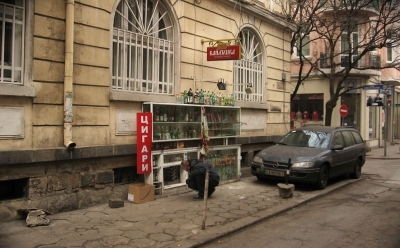 It also took me a while to notice the shops in the centre of Sofia that were seemingly under the pavements. They were actually the underground floor of a block but you'd see people kneeling down on the side of the pavement talking to someone through a little window and then a hand reaching out and handing them cigarettes, water or whatever it was they had ordered. I don't know why I didn't notice them at first but when I did I saw they were everywhere. It took me a little while longer after noticing them to pluck up the courage to use them. First of all it just felt really strange kneeling down on the side of the pavement and talking to someone through that little window. Secondly it wasn't like a normal shop where you could browse, see all the things for sale and then take it to the counter. Often you couldn't see anything that was being sold and had to know what you wanted in advance when you gave your order through the window. If you weren't very familiar with the brands and names you could easily get stuck explaining what you wanted. Well I did anyway. I'd ask for water and they'd ask what kind of water and I'd get stuck right there. In the end I worked out just saying "Една вода, голяма" got me what I wanted. If I'd gone to a shop in the UK and just said "one water, big" I don't suppose I'd get a very good reaction, but here there were no frills, get to the point and get on with it. That night I was due to visit a woman called Krasi. 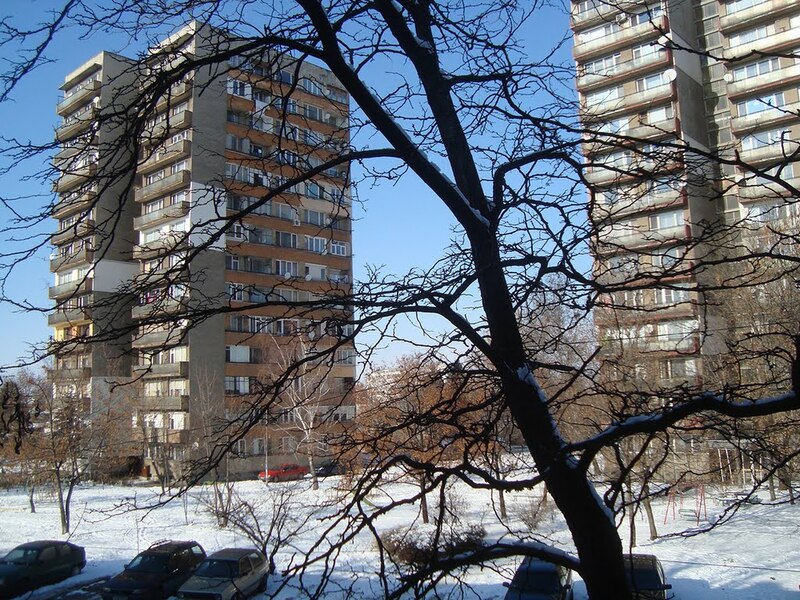 Krasi was Alex's mother, a Bulgarian friend from Tenerife, and lived in a suburb of Sofia called 'Захарна фабрика'. This translates as 'Sugar factory' so it sounded quite exciting. I still wasn't feeling at all well but the visit had been arranged ages ago so I felt it might be a bit rude to pull out at the last minute. I didn't have a clue where Захарна Фабрика was or how to get there on a bus. Krasi had given me the exact address so reluctantly I got a taxi. As we turned off the main road I could see Захарна фабрика didn't look much like the sugar factory I was optimistically imagining out of Willie Wonka, but it did look very industrial. There were noticeably more gypsies in this area, the taxi overtook a horse and cart carrying what looked like a fridge and loads of metal, with a couple of dogs running alongside. Krasi lived on the ground floor of a tall tower block and gave me a warm hug and kiss before making me put on the mandatory pair of slippers. She took one look at me and announced in a loud voice that I was ill. She sat me down in the living room and told me to wait. Two minutes later in she came carrying a huge tub of boling hot water, instructed me to take my slippers and socks off and to put my feet inside. I did as I was told, or at least I tried to do what I was told as the water was literally boiling hot. Krasi insisted I try to put my feet in, I was sure I was going to be scarred for life with the burns. I think my feet must have gone numb with the heat because after about 5 minutes I did manage to submerge them fully into the tub. I managed to eat something but I just wasn't hungry. I felt a bit guilty because Krasi had obviously gone to a lot of effort judging how nice the table looked with all the different dishes on it. I wasn't allowed to take my feet out of the tub of hot water and was beginning to work up a sweat. To add to that Krasi had thrown a big blanket over my shoulders and brought me a hot drink that looked suspiciously like Rakia. It did indeed turn out to be hot Rakia but with honey in it. I must admit I did start feeling better after drinking it. Why do we bother with Lemsip back home? Strong alcohol with honey in it is much better. Before I knew it I was being told to take my jumper and thermal vest off (my mum had sent a pack of 10 over when I told her it was below freezing here). Krasi handed me a bottle which she said was 'първак' or really strong Rakia and intimated that I rub it over my chest, neck and shoulders. Now this did seem quite strange and I wasn't totally sure what the point of the exercise was. To cap it off Krasi then appeared with a huge roll of cotton wool, sprinkled the 'първак' on to it and proceeded to bandage it on to my chest and neck. I felt like an alcoholic mummy. Back on went my thermal vest and jumper and I was told not to take off the cotton wool until the next morning. Before calling a taxi Krasi had changed my normal socks for thick woolen socks and had made me wrap a woman's scarf round my neck. This too I wasn't to take off until the next morning. Walking out of the block to the taxi I felt as if I was 3 times my normal size with all this cotton wool under my top. My chest was looking pumped as if I'd been in the gym for the last 3 years. It was only the woman's scarf that was spoiling my new bodybuilder look. I must have absolutely reeked of Rakia when I got in the taxi as the taxi-driver did a sharp exhale of breath as soon as I sat down and told him where I wanted to go. He must have thought I'd had a long session on the booze, but at least he charged me less than the taxi driver who brought me. Maybe it was because he just respected me for smelling so much of Rakia but still being able to walk straight. I did follow Krasi's instructions and not take the cotton wool or scarf off until the next morning and to my great suprise felt a hundred times better. I don't know whether it was the boiling hot water or the Rakia that shocked the virus out of my system. Copyright © 2019 The Bъlгarian. All Rights Reserved.